What is the world coming to?!?! And a McBlowjob to go, please. Ba Ba Ba I'm Lovin' It! would you like that supersized with a large vanilla shake...? 2 for 1 on blowjobs. NOW AT MCDONALDS. o do do do do , im lovin it! This is why I'm scared of clowns. I got your Happy Meal right here! I got your Big Mac right here! 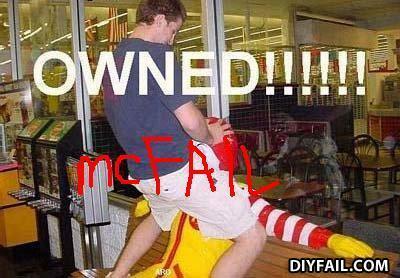 Hey Ronald...do you think my nuggets are salty?? I can't tell if the guy is pwning Ronold or doing him. there was a teacher at my old school called MRS.MCPHAIL. Why was the orphan's christmas sad? He got a violent chest infection and died.